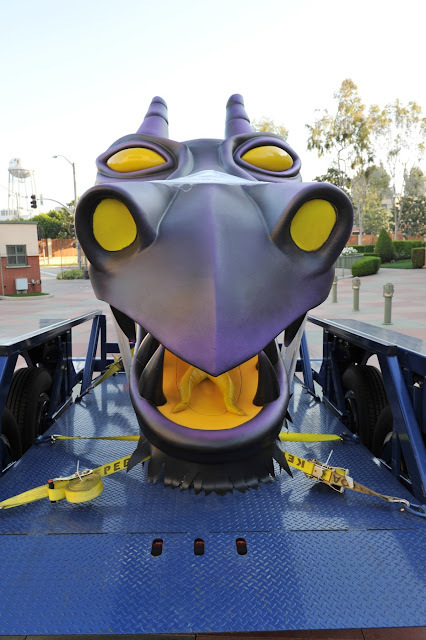 Do you remember Maleficent from Disneyland's Fantasmic! nighttime spectacular show? 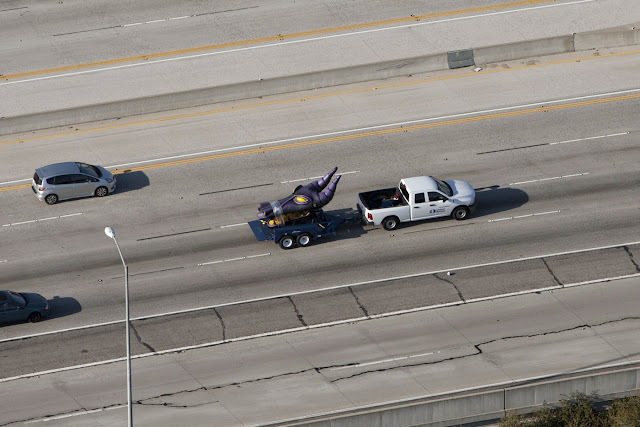 If you happened to be driving on the I-5 at 6am this morning, you might have been one of the lucky spectators to see the dragon being transported. In preparation for the D23 Presents Treasures of the Walt Disney Archives this summer, D23 transported the Maleficent dragon head from the Disneyland Resort to the Ronald Reagan Presidential Library & Museum this morning. The dragon left from the Disneyland Resort at approximately 6am this morning, with an estimated scheduled delivery time of 8:30am. The D23 Presents Treasures of the Walt Disney Archives Exhibit opens to the public on Friday, July 6, 2012. The goodies we get to see, living in our lovely SoCal! As a dear O.C. friend says, "Our local news IS national news." Perchance not as a rule, but more often than, say, Pungo, VA or Whistler, Canada. When Lindsay's a good girl or Maleficent's noggin sprints down the 5, it makes, at the very least, Weird News across the land. Love it!